Hehe, no worries. I forgot you hadn't played Skyrim. Ok. But with a setting like that I hope you realize that most of the GMing, especially at first, would have to be by you, since you know the world. This is true, but I think I should be able to handle that. And if I can't, then oh well. It's not like the fate of the world rests on this RP going perfectly. Well, I'll need to read a bunch of stuff first, but I'm interested. I'd recommend the Elder Scrolls Wiki, not the UESP. The info on UESP is solid, but it's not as easy to navigate and the pages are written in a way that, at least to me, seem like they expect you to already know the lore. You'd have to ask him via Steam, I don't think he checks any threads outside of the ones he's already in on this site. I talked to Chris, he said he'd get back to me. Okay, I think it's about time we introduced our characters, and also started working on the story. My character might take me a few days to make. I'm house-sitting and remodeling my room, so I don't have a lot of time on the computer. I'll work on it though. Okay, I'm still working on mine as well. As I said yesterday, I think it's time we start working on the story. I was thinking it should take place roughly 200 years after the events of Skyrim and it's DLC. Fine with me, though honestly I won't know what that means save for what you tell me given my very limited knowledge of TES lore. Basically, the Mythic Dawn have returned and are being led by an extremely powerful Dremora Warlock known as Maeryn (may-rin). The Mythic Dawn are a cult devoted to bringing the Daedric Lord Mehrunes Dagon into Tamriel. They were the main antagonists in the fourth Elder Scrolls game. Mehrunes Dagon sees this as the perfect time to breach Tamriel because of the political turmoil. 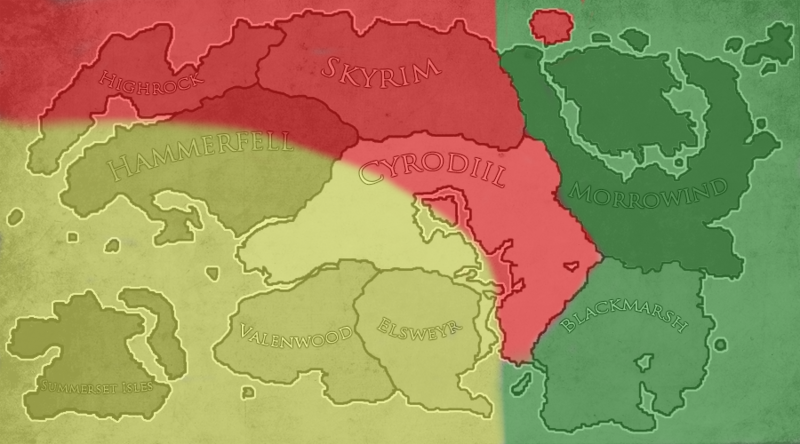 The Empire has been brought to its knees due to its war with the Thalmor. The Argonians have taken control Morrowind during this war. I'm working on a faction map just so you can see what all is going on. Basically it means that Most of Tamriel is off limits because of the Thalmor, and the Empire is very weak from its war with the Thalmor which allows crime to be very common. I have made some changes as far as the main storyline. There's already several RPs out there that catalog non-canon events that involve the Mythic Dawn returning, so I'm going to change the storyline. I'm gonna be a male orsimer(orc) barkeeper. Haven't decided on the bar or character name yet. The main post for the RP has been completed. You can see it here. I made one character sheet, but I'm too lazy to take the screencaps for the others right now. Too much work putting in all the console commands. I'm working on my character right now, but it might take me a bit if I get called away to help with the floor renovations upstairs. I'll draw a picture eventually, but I'm a terrible procrastinator, so I'm not going to even guess when it will be ready. Hi peeps! Being new here, I'm not sure which RP I can join... or can I interest anyone in starting a new 1? I'm a big fan of cyberpunk settings and novels, and I got quite a few ideas there... not so much Fantasy fan, except LOTR, to a point. SF works 2, mainly Andromeda and Star Wars.